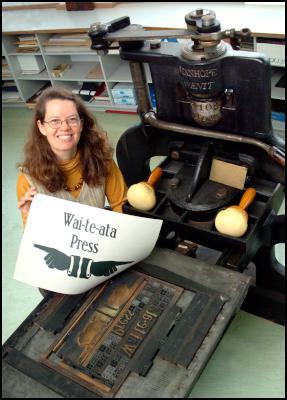 In today’s digital age, Victoria University’s unique letterpress printery the Wai-te-ata Press continues to shine, and invites the public to help celebrate its 50th anniversary at a lecture on Thursday 22 March. A space to explore books and print in all their myriad forms, the Wai-te-ata Press boasts a collection of 15 working printing presses dating from 1813 to 1963. Originally located in two garages on Wai-te-ata Road, the Press moved to Victoria University’s main Library on the Kelburn Campus in 2008. Wai-te-ata Press was founded in 1962 by Professor Emeritus D.F. McKenzie, and has provided generations of students with the opportunity to learn the process of hand printing and fine design. It thrives on a rich legacy of preserving historic printing equipment, teaching the intricacies of print, communication and culture, undertaking special printing and publishing commissions, and as a centre for traditional and digital historical research. The first acquisition by Wai-te-ata Press was an 1813 Stanhope Press which remains on indefinite loan from Cambridge University Press, UK and takes pride of place. One of only 16 left in the world, it is the oldest printing press in New Zealand and is still being used. Several significant New Zealand’s writers including Alistair Campbell, Vincent O’Sullivan and Bill Manhire were first printed and published by Wai-te-ata Press during the 1960s and 1970s, a key period for the development of New Zealand literature. The Press is also used by professional designers wanting an aesthetic edge to their designs. Most recently the lead designer of Te Papa’s exhibition Oceania visited Wai-te-ata Press to photograph individual wooden types which were then digitised and reassembled for the exhibition displays. “I cannot wait to see how new technology and print continue to evolve side by side for the next 50 years,” Dr Shep says. The public lecture is just one of the events planned for celebrating the 50th anniversary. More information will be advised later in the year. On the occasion of the 50th anniversary of Wai-te-ata Press, you are invited to attend a lecture in honour of its founder, Professor Emeritus Donald F. McKenzie. The lecture delivered by Professor Leslie Howsam pays homage to McKenzie’s contributions to international book history scholarship. To secure a seat, please email wtapress@vuw.ac.nz with ‘lecture’ in the subject line.